Cut the ginger chunk in half. Rough chop one piece of ginger and cut the other piece into matchstick sized pieces. Rough chop 2 of the garlic cloves and mince the other two. To a blender, add the canned tomatoes with juice, onion, rough chopped ginger, rough chopped garlic, jalapeños, coriander seeds, cumin seeds and cinnamon stick pieces. Purée until smooth. If the mixture is too thick, add water 1/4 cup at a time until the blender will make a purée. Heat the canola oil in a 10-inch straight-sided skillet over medium heat until shimmery. Add the matchstick ginger and minced garlic. Stir-fry until they just begin to turn light brown, 1-2 minutes. Add the tomato purée and stir in paprika, cayenne, turmeric and 1/4 cup of the cilantro. Partially cover the pan and let cook, stirring occasionally, for 5 minutes. Add the chicken and chickpeas and 1 cup of water. Bring to a boil over medium-high heat. Reduce heat to low and let cook uncovered for 25-30 minutes. Stir occasionally. Just before serving, stir in garam masala, lime juice and remaining 1/4 cup cilantro. Serve with basmati rice or naan bread. 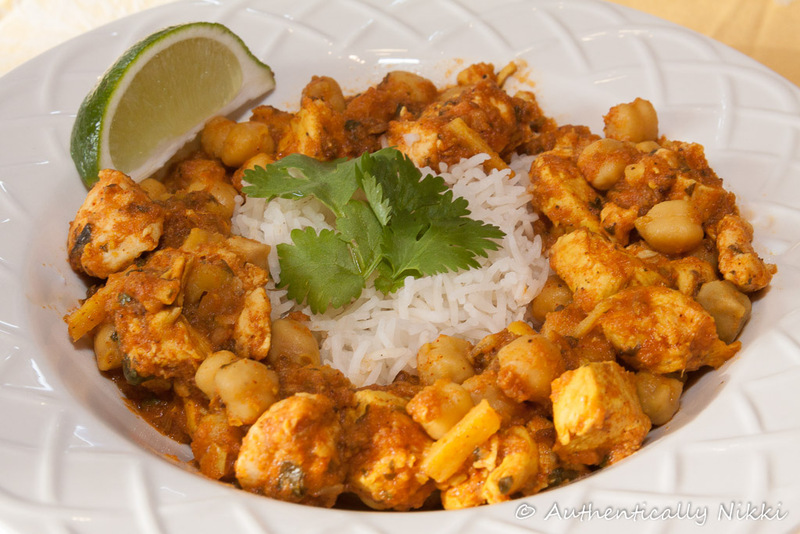 This entry was posted in Curry, Food, Poultry and tagged chicken, chickpeas, curry, ginger, Indian by authenticallynikki. Bookmark the permalink.